Every year on Palm Sunday, communities in Central America recreate the Biblical passage in which Jesus is welcomed into Jerusalem a week before his crucifixion, with his followers laying down palm leaves in front of him as he rode in on a donkey. Except instead of palm leaves, they make a colorful alfombra, the Spanish word for carpet, or alfombra de Aserrín (“sawdust carpet”), during Holy Week. See the 2016 and 2015 alfombras. 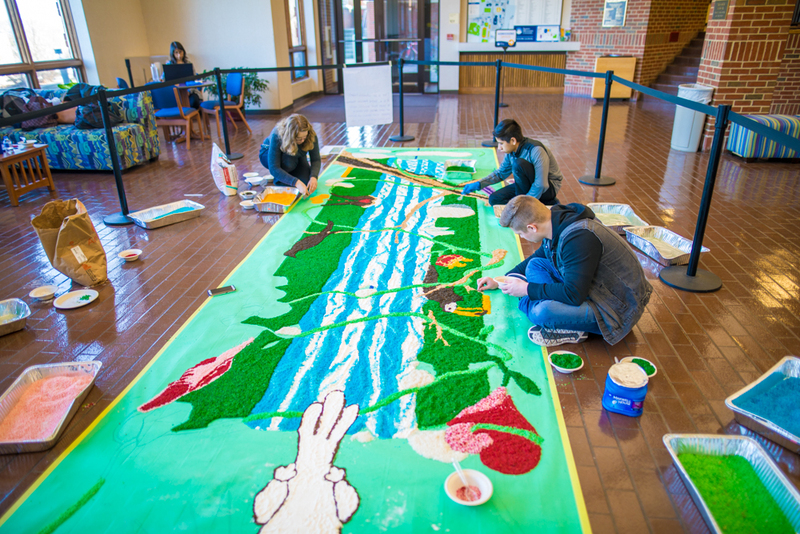 Pans of colored rice await their placement into the artwork, which was designed by Latino Student Alliance members and drawn by student Joshua Curtis. A procession then makes its way through the town to the church, Hernandez explained, with the crowds walking over the carpet. 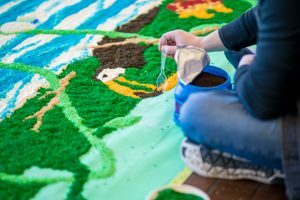 EMU’s LSA has created their own alfombra “rug” made primarily out of rice, along with flour, coffee grounds and sawdust, depicting Biblical symbols like a large white dove, a cross, a lamb, a waterfall, a heart and hands and a green vine that weaves throughout the length of the alfombra. LSA members have been working on the alfombra all semester. “When we started, we had a conversation the second week when we started class … about our faith journey, and then we had to visualize what Jesus means to me during Holy Week,” said Maria Esther Showalter, LSA’s faculty advisor. Each student made a drawing, and Joshua Curtis, 21, a junior art major, combined all the drawings together to make one big alfombra. They then decided on what themes they wanted to convey. “A lot of people in the club wanted the natural theme,” he said. Coffee grounds form the body of a toucan in the alfombra. The students color-coded the drawings and then started the dyeing process of the rice using food coloring. 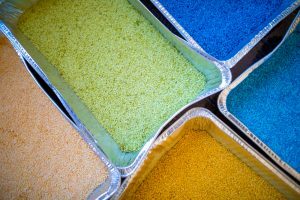 They dyed 180 pounds of rice for the alfombra. Coffee grounds and sawdust were donated to the project. This is the third year LSA has made an alfombra for Easter. Senior Anna Messer learned about the alfombra tradition when she did a cross-cultural trip in Guatemala and Cuba. The 22-year-old said the alfombra has served as a tool to educate the EMU community on Latino traditions while celebrating faith. [Editor’s note: The alfombra was the centerpiece of a March 28 chapel service.] Speakers will present the alfombra during the service and discuss the different aspects of the piece and reflect on its meaning. Unlike the usual tradition, the carpet will not be walked on. The students have identified four main themes in the piece that represent Easter: a season of abiding, a season of renewal, a season of hospitality and a season of redemption. The green vine that courses through the alfombra is meant to symbolize that, if one abides in Jesus, “he’s going to bear much fruit to us,” Messer said. The heart represents “a season of renewal” and “how our hearts are breaking just as Christ’s heart had broke for us and the sin of the world and how he continues to restore and renew in us,” she said. The lamb and cross represent “a season of redemption,” in Jesus’ crucifixion and resurrection, as does Zury Lemus’ drawing.”There are two hands with the heart inside and the hands with different colors of brown and white, representing the ethnicity of all of us and the heart — the love we have for each other — and the love of God also. And the drops of blood represents the crucifixion of Christ, that he gave his blood for us,” said Lemus, an exchange student. The rice will be donated to a local day care center once the alfombra is taken down after the chapel service on March 28. This article was published in the March 24, 2018, Daily News-Record.